A landing page is the best way to capture a potential customer’s attention and get them to convert. Whether that conversion is making a sale or getting an email address, a landing page is the tool that you use to do it. The page states your offer, talks about the benefits that your business offers, and deals with potential objections that customers may have. 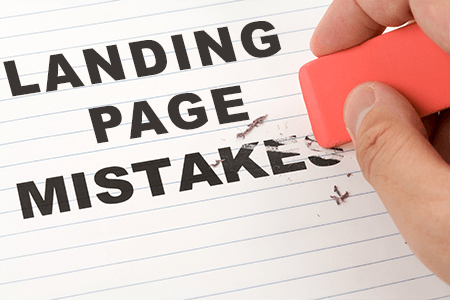 We’ve already written about 5 Steps to Make a Great Landing Page, and in this article we’re going to talk about 10 common mistakes that businesses make when they’re creating their landing page. Let’s get started! The best landing pages only have a single column of text and images. The reason for this is simple. Marketing research has shown that a single column design looks the cleanest, offers the fewest distractions, keeps readers engaged, and gets the most conversions. In another article we talked about why you should be using split testing on your website, and this is especially applicable to landing pages. Once you’ve created your landing page and it’s ready to go live, you should create another slightly different version so that you have two similar pages. Then you can send traffic to both of them and see which converts better. You can continue split testing until you’ve reached an optimal conversion rate. Your landing page is designed to get conversions, whether in the form of a sale or capturing an email address. That should be the sole focus of the page. You should make it clear what you want people who land on the page to do. Don’t cloud the message by trying to get them to visit other areas of your website or take several different actions. Pick one thing you’d like your landing page to achieve and then focus on that action. Good images are an important part of a landing page, and it’s important to take the time to get them right. You shouldn’t be using clip art, or other random images that you may find with a Google image search. Spend the money to invest in a ShutterStock account and you’ll have access to millions of unique images. Giving a customer an incentive to take the action you want is a crucial step in getting conversions. This can go in several different directions. If you want to capture email addresses you might consider offering a free eBook. On the other hand, if you’re trying to make a sale, you might want to use urgency to try to get people to buy the product or service. Some businesses create a landing page that looks and feels totally foreign as compared to their original website. This can be confusing for customers and can reduce your conversion rate. Your landing page doesn’t have to match your website in every way, but it should have a similar color scheme and font. People come to your landing page because they want to find out about the benefits that your product or service can offer them. They don’t want to know too much about your business, or why it’s the greatest ever. They simply want to know how you can help to make their lives easier. A landing page is an instance where it probably makes financial sense to hire a copywriter. Even though you might pay close to $1,000 for a single page of text, if that results in a 50% increase in sales it’s going to be worth it in the long term. Copywriters know how to write engaging text that causes people to convert. Landing pages should be neat and tidy. A page of text with enough images in it to keep it interesting. You don’t want random menus, widgets, or links to other pages on your website. Keep a landing page simple and straightforward. If you’d like to see some examples of great landing pages, check out HubSpot’s post which features 15 of their favorites. If you have other questions about website design, or you’d like help implementing a landing page on your website, don’t hesitate to contact Superiocity web design today! We’re a Florida based company with an excellent track record, and we’re ready to help you to take your website to the next level.